Disclaimer: Rant Ahead. You’ve been warned. What is the basis for the American driver’s fascination with the left lane? I would guess that more than half of the vehicle miles travelled on multi-lane highways in America are in the left lane. And of those miles, nearly all of those are driven with another car pressing close on the back bumper. And far too many of them are driven with the right lane unoccupied. I generalize… My experience has shown that this phenomena is concentrated in the Pacific Time Zone. I have seen perfectly sane lane usage in Mountain Time Zone and Central Time Zone. What is up with people’s adverse reaction to the right lane? I think they see the right lane as slow. Speed limit – In Washington, the maximum speed limit on the freeway is 70 miles per hour. In Oregon, it is 65 miles per hour. In California, it is most often 65 miles per hour. In Idaho, Nevada, Utah, Wyoming, Colorado, Nebraska, and Kansas, it is 70 or 75 miles per hour. On the West Coast, I’m stymied by the left lane slowpoke. In the intermountain west and the plains, the left lane more often is free flow. Coincidence? Perhaps. Or perhaps the difference is a larger speed difference between “fast” and “slow” cars meaning that passes can happen in a shorter time and the passing car can easily move back right. Truck speed limit – On the west coast, big rigs have a slower speed limit. Washington, Oregon, California, and Idaho all have lower speed limits for trucks. It is generally 10 miles per hour slower than that allowed for passenger cars. California even extends this lower limit to all vehicles towing a trailer – even your PT Cruiser with the 400 pound Harbor Freight trailer. This difference does not exist in Utah, Colorado, Wyoming, Kansas, and Nebraska. Where the speed limit is split, trucks are often a rolling road block. This is especially true if one truck is passing another. Where the speed limit is the same, the trucks are just another vehicle on the road. Travel in the right lane is faster. People are more likely to use it. Put the two together… The right lane is often slow and empty on Interstate 5. No one really wants to get stuck behind a truck driving 58 miles per hour on the freeway. And the old guy driving his Buick 62 miles per hour trying to pass the truck is just stopping things up. Open the freeway up to 75 miles per hour and let the trucks drive that speed… and the old guy is in the right lane doing 62 miles per hour with the truck passing him at 72 miles per hour and then pulling back into the right lane. There are other arguments about safety and why what I suggest isn’t a good idea. There is merit to those arguments. There will always be the argument that Americans lose 15 IQ points getting behind the wheel of their car so someone will still clog the left lane. I can’t argue much with that either. We need stronger driver education (Can someone teach a brother or sister how to merge?!? ), tougher licensing requirements, and better enforcement of traffic laws regulating lane usage? You bet, those will all help. My point is that operationally speaking, we have legislated ourselves into gridlock and frustration on the highways. This entry was posted in Personal and tagged Traffic. Bookmark the permalink. This is true for the Freeways on the east side of the sound, but if you venture over to the west side, its a much different story. I drive to Aberdeen quite a bit, and it always shocks me the level of respect other drivers will give on the road. 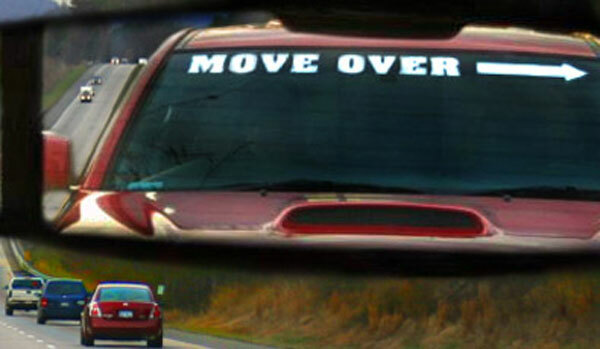 The almost always move over if they are in the left lane, and you are approaching from behind. This makes my trips pretty interesting. Half my drive is along I5 the other half is highway 101/ highway 8. This means I deal with idiots in Prius’s driving the speed limit in the left lane for an hour, then an all out sprint for the next hour, where people get out of my way! I am truly considering moving to a small town out in the west side. Ditto for the East coast – seems to become more of an issue the closer you get to a main coast it this country.